Okay, let’s get this out of the way right now so we can get on with the review. Yes, this album cover needs a unicorn. It’s the first and foremost thing any of us noticed in the AMG World Headquarters break room1. I don’t know what’s going on with this horse, but it won’t be good when and if it comes back down to earth. I suppose it’s escaping, although maybe it’s just simply jubilant. Regardless, it provided initial distraction from my main task, which was dissecting this enormous album from Crippled Black Phoenix: eleven songs over 74 minutes, to be precise. At that colossal length, is Great Escape going to make me jubilant, or am I going to want to make my escape? Great Escape is a deeply personal album. Band leader Justin Greaves (Iron Monkey, Electric Wizard) has not been shy about his battles with severe depression. A wide range of emotions are explored here – from anger in “Rain Black, Reign Heavy” to forgiveness in “Nebulas,” and everything in between, but the thing with personal albums is they have to connect with the listener, and Great Escape fails on this level more often than it succeeds. 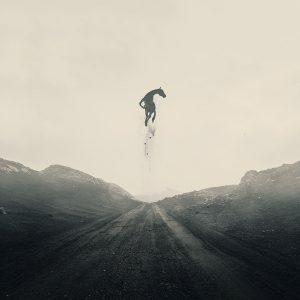 Crippled Black Phoenix’s brand of dark, melancholic progressive doom is a perfect vessel for these emotions, and lyrically the album works, but as is often the case with CBP, the songs themselves fail to leave their intended mark. In 2016, Bronze gave me one of my favorite songs of the year: “Champions of Disturbance ((Pt 1 and 2)” was my #2 song back then2, and still gets played often. While Crippled Black Phoenix don’t come close to that kind of magic on Great Escape, there are some wonderful songs. “To You I Give” is the second song, and the first real cut after an intriguing voiceover intro about society and the insanity of conforming. It’s a nine-minute progressive doom track, epic, lush, and dreamy, with a great arrangement. “Las Diabolicas” and “Madman” sound as if they were influenced by recent Ulver output, hypnotic and sinister, and although the arrangements wilt, the songs are still album highlights. “Slow Motion Breakdown” is a climactic, well-arranged instrumental track that keeps the listener engaged. The disappointments outnumber the strengths, though. “Uncivil War (pt 1)” is the shortest song, darkly ambient with a building militaristic drum pattern that dies on the vine before it even gets going. And there’s no “pt 2” to be found3. But the longest songs are where the greatest disappointment lies. “Times, They are a Raging” has the band’s typical serene Pink Floyd feel to it, but the twelve minute track is just too ponderous. It’s a fine line where long songs work (“Champions of Disturbance” is nine minutes and engrossing all the way), and this one doesn’t. And the title track, a two-part, twenty-minute extravaganza, has brief moments of emotional clarity but ultimately meanders far too much within its own ambiance. I find myself looking at football injury reports instead of being fully captivated. Much like their previous efforts, Great Escape is a mixed bag of uneven offerings. Directly compared to Bronze, the overall quality is a touch higher but Great Escape is missing that home run song the predecessor had. Great Escape has the potential to be a beautifully melancholy piece of progressive doom, but not enough of the 74-minute run-time crawls under your skin and stays there. Crippled Black Phoenix are a band I want to like more, but the material continues to fall short of their potential.